38 members and former members gathered early this morning to celebrate as Morningstars Toastmasters marked 20 years as a club. With balloons overhead and agendas and name cards for all, we began our special meeting marking 20 years. “Kind, confident, and caring” were just three words used by a former member who joined us for the occasion. The meeting was chaired with his usual poise by PJ Reece. PJ in his role as chair of the meeting. “Very inspiring, filled with kindness. Loved it.” Comment from a guest. Our Sergeant at Arms Guy Foster arrived at 5:00 am to set up the room and make a welcoming space. “I am happy to finally get myself out of the house early enough to get to a Morningstars meeting. I had a great time, the energy was very high. Everyone was welcoming. Thank you and congratulations for your 20 years. ” Comment from a guest. The group gathering prior to the meeting. What’s a special meeting at Morningstars without breakfast? Including Sandy’s famous cheese scones fresh out of the oven. Everyone at the meeting received an agenda to follow along with the different roles. Our agenda for the meeting, thanks to our chair who made enough copies for everyone! Our Inspirator, Frank Coldicott, who as a long time Toastmaster, gave us the historical context for Toastmasters international. Marc in the role of Grammarian for his first time since joining. 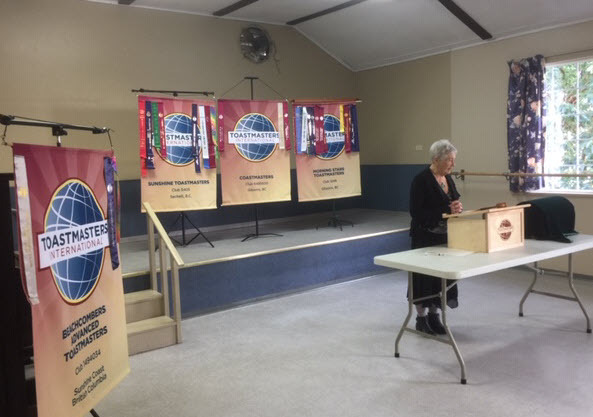 Patricia, Distinguished Toastmaster, giving her first speech in the new Pathways Program. Michael, our Past President, in his role as Table Topics Master, had some great questions for our impromptu table topics speeches. Greg answering the first table topics question. One of the greetings from a former member who was not able to attend gave us all a glimpse into how much influence TM has in peoples’s lives. Tammie, a former member who has moved out of the community, reminded us of a table topics speech she gave on the textiles of Bali. Members still remember her vivid description, and she shared with us that she has now booked a trip to Bali. We might need a bigger room for the next party! A former member and part of the executive team of Morningstars sent the following message. “Congratulations you bright MorningStar‘s on this 20th year anniversary! I wish I could be there to celebrate with you and to share in the stories of transformed lives! The foundational leadership base in the club is unmatched… I personally owe them a mountain of gratitude for their unwavering belief that I could become all that I was created to be. Their fundamental belief that EVERYONE, with a healthy dose of affirmation mixed with hard work, can become a better communicator and in turn influence the world around them, has made the club a smashing success! I give a hearty hip hip hooray to the Magnificent Morningstars of the Sunshine Coast on their 20th year anniversary! Thank you to all members, former members, and guests who made this such an exciting event as we launch into our next 20 years. Is Morningstars Really 20 Years Old? It’s been an exciting, fun, and fruitful 20 years since Morningstars Toastmasters Club had its first ever official meeting in March of 1999. The club was officially chartered on Mar 22 of that year, and has been thriving ever since. 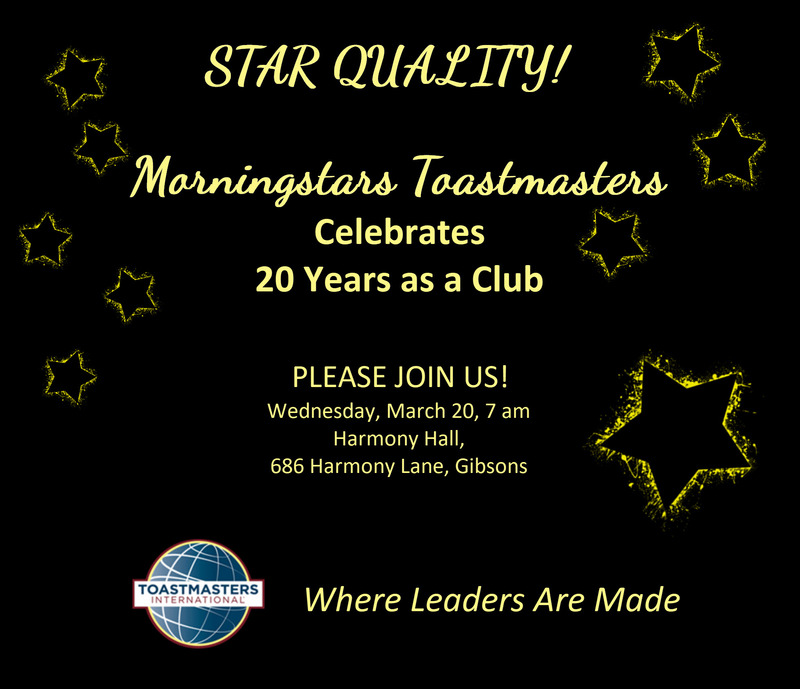 And on Mar 20, 2019, Morningstars Toastmasters is celebrating 20 years as a club with a special breakfast and reunion meeting of former members and new guests. The ‘party’ will be held from 7-8:30am at Harmony Hall, Gibsons. “Star Quality” is the theme for our celebration and represents the Morningstars experience over the years. It’s the time of a new moon and the spring equinox, and the perfect moment for launching into new beginnings. You could say the stars are lining up for Morningstars’ as we “support each other to shine” in communication and leadership development. Please join us for this auspicious celebration. For more information contact Johanna, VP of Membership at six o four, eight eight six, three one five seven. 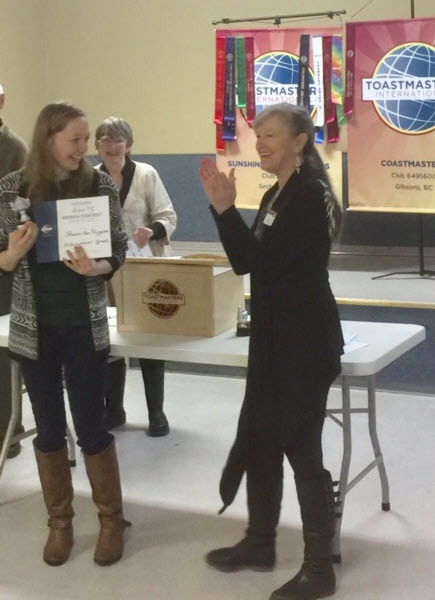 Speech contests play an important role in the Toastmasters educational program. 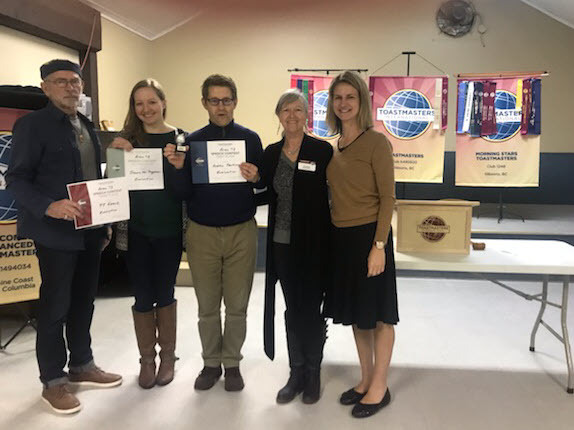 They provide an opportunity for Toastmasters to gain speaking experience, as well as an opportunity for other Toastmasters to learn by observing proficient speakers. This year our talented speech contest participants were D’Arcy, Johanna, and Michael. Congratulations! Special thanks to Greg for stepping up as contest chair and more thanks to all the helpers that made the contest possible. You know who you are! We were a full house this morning, complete with five guests who risked certain death to check out what might cause otherwise normal people to assemble at Harmony Hall at the crack of dawn. The answer, of course is that Morningstars meet to confront their fear of death, otherwise known as public speaking. And have a helluva good time in a process that never seems to end. Start your day right was the theme for our breakfast meeting, but it’s true every week on Wednesday mornings for members of Morningstars Toastmasters Club. As the General Evaluator of the meeting, I’m meant to keep my eyes and ears open in aid of presenting an end-of-meeting report. The G.E. is generally expected to evaluate those presenters who haven’t so far haven’t received feedback. But I prefer to comment on the big picture, to assess the success of the meeting as a whole. What are we doing right, and how can we pull up our socks? I like this role because it obliges me to view the proceedings with a soft focus. Someday I might attend with eyes shut entirely. And why not? I know artists who insist they see better in the dark. With guests in the room, presenters are mindful to explain their roles. Guests bring fresh energy. Members are on their best behaviour, making an extra effort to be at the top of their game. I suppose that watching the meeting through the eyes of our guests might make us extra conscious. With a packed room, commanding everyone’s attention is a challenge, and I thought Sandy Wrightman did a masterful job. 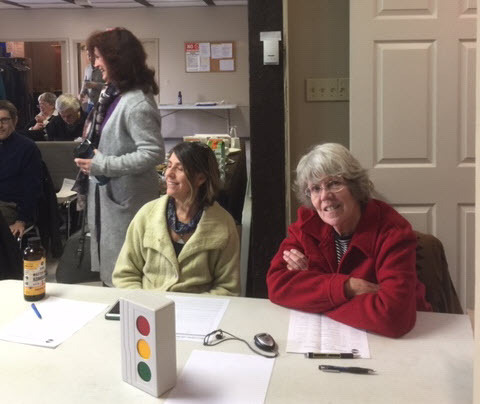 When someone entered after the meeting had begun, I watched Sandy successfully incorporate the hiccup into her banter, and I knew we were in good hands for the next hour and fifteen minutes. It’s a joy to see how members have grown into confident speakers. And it doesn’t happen overnight or even a year. It takes years for the confidence to quietly build, as it has for Sheila Cameron who kicked off the meeting with her “Inspiration” for the theme, and her toast to Starting the Day Right With Self Care. Thank you, Sheila, you are an inspiration. And thank you, Merrilee MacGregor, for a speech that taught us how to psych our way around/through/past the growing number of con artists in our midst. You’ve come a long way in a short time as a Morningstar. And kudos to Michael Worsfold for a speech on mentorship. Personal stories never fail to make a memorable speech, and Mike showed us how with his memories of being mentored through his first few years in Toastmasters. It’s a good feeling, hanging out in the presence of people who have the courage to confront their fears. Nowhere more obvious than during Table Topics. When I watch an impromptu speaker accept the challenge, it’s vicarious excitement for me, too. It proves beyond a doubt that the reason we show up every Wednesday morning is to grow. This morning’s meeting, that’s what it felt like to me, like a training. With eyes half-closed, I could feel the sincerity of members showing up to continue the training. Many of us have been members for years, and we’re still learning. 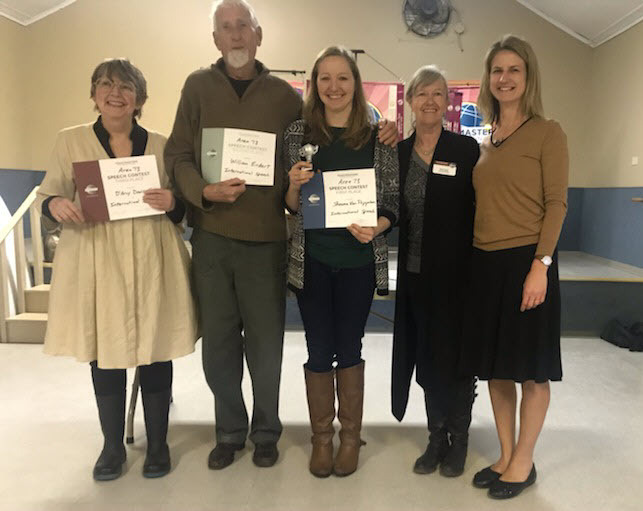 The Area 73 Extravaganza went off without a hitch, thanks to the efforts of Area Director Debra Taylor and her team, Johanna Rzepa, Maureen Mcbeath, Kim Hart, William Baker. Special thanks to Christina Bacigalupo for providing the sound, and Weegee Sachtjen for art and promotion. It was a spectacular day with views of the North Shore mountains and across Georgia Strait to the island from the steps of the venue, the Historic Heritage Playhouse. Things got under way when our extravagantly dressed Master of Ceremonies the great William Baker introduced Debra who explained the theme “extravaganza, extravaganza”, “Its just fun to say”, but the planners were extravagant in many ways. Not just humorous speech’s or tall tales, but both, not just one speech and an evaluation in our evaluation workshop but 2 speech’s and two evaluations done Pathways style. An amazing workshop was facilitated by Maureen McBeath. Thoughtful, educational, supportive feedback was given by Dawn Miller evaluating Shawna van Poppelen with her hot topic speech that really spoke to anyone serious about the environment. Next was an extravagant lunch with homemade goodies provided by Johanna, with a little time for networking. Another extravagant idea was to offer as a prize 2 chances to speak on the big stage, table topics style to any guest whose name was drawn. Great fun. Both speakers received an expert evaluation by Sandy Wrightman. Next we heard humorous speeches from Neil Booth and Charles Jeffrey in contest style, There was plenty of laughter, so they hit the mark on humour. Again, extravagant but both speech’s received killer evaluations by Janice Parkinson and Girije Edwards respectively. What came next was nothing short of amazing as our three Tall Tales speakers -Bill Endert, Krystin Clark, and Haida Bolton – absolutely crushed it. We will see more from them come contest season for sure. The team mixed it up again with a round robin style evaluation followed up with written evaluations by three talented evaluators Michael Worsfold, Haida Bolton and Krystin Clark. We were excited to have with us Area 73 Director Debra Taylor, Division H Director Charles Jeffrey, District Public Relations Manager Neil Booth and all the way for Vancouver our District Program Quality Director Louisa Davis who treated us to an icebreaker like speech that gave us an insight into who she is, as well a look at what Toastmasters can do for you. Yes she also updated us on all that’s going on in the District. Timing for our event was expertly choreographed by Katherine who gave a report at the end. Ben Rusuisiak offered just the right balance of encouragement and points of improvement as the General Evaluator. William Baker had the last word noting that we finished spot on time. It was a great time, and I think Debra is already planning the next one. Thanks Debra.